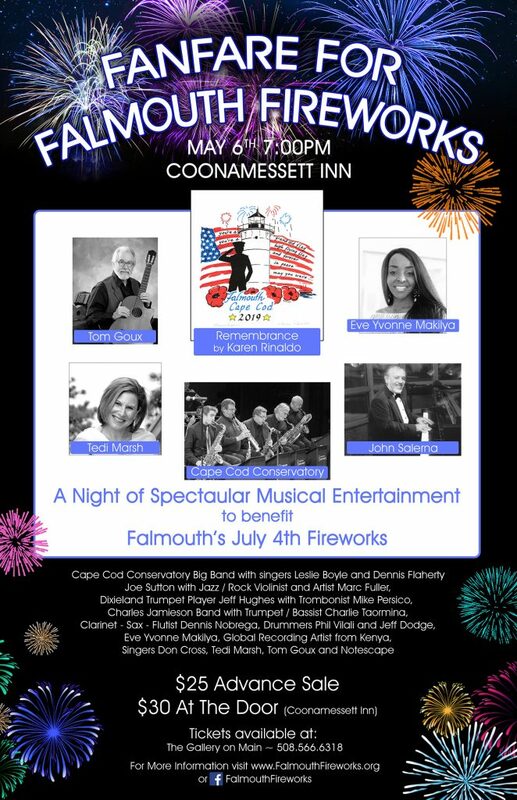 Fanfare tickets can be purchased at the Coonamesset Inn, the Falmouth Chamber is Commerce and The Gallery On Main. The poppy became the symbol of Remembrance with the poem “In Flanders Field” when the author, a war-time surgeon, looked over a former battlefield in France to see that now poppies bloomed where the war had raged. Shirt design by Falmouth artist Karen Rinaldo. As in years past, traffic will be restricted from entering the Falmouth Heights area at 6 pm. The restriction will stay in effect until the spectators have safely left the area. Grand Avenue (South), between Walden Avenue and Central Park Court, including all metered parking spaces. Worcester Court, between Jericho Path and Grand Avenue (South), including the grass median. Please refer to our Parking page for more information. Handicap parking is available at Bristol Beach and Surf Beach parking lots. 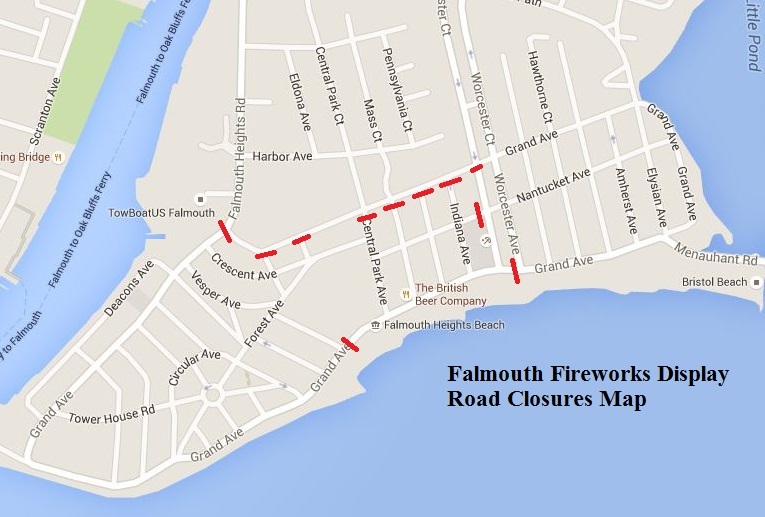 In an attempt to alleviate traffic congestion as a result of the heavy volume created by the annual Falmouth Fireworks Display, the Falmouth Police Department has devised a traffic plan for vehicles exiting the Falmouth Heights area. Police officers, along with electronic message boards will guide motorists out of the Falmouth Heights area. Please refer to our Traffic Route Map. All motorists are advised to plan their route in advance. The Falmouth Fireworks Display is a non-alcoholic event, and all laws governing the possession and consumption of alcoholic beverages will be enforced. The public consumption of marijuana is prohibited in the Town of Falmouth, including at the Falmouth Fireworks Display. All laws governing the public consumption of marijuana will be enforced. In the interest of public safety, all containers (bags, coolers, etc.) will be subject to random search. It is strongly recommended that attendees do not bring a cooler. For detailed Falmouth Fireworks Display information, please contact the Falmouth Chamber of Commerce at 508-548-8500 or visit the Falmouth Fireworks website for more details. 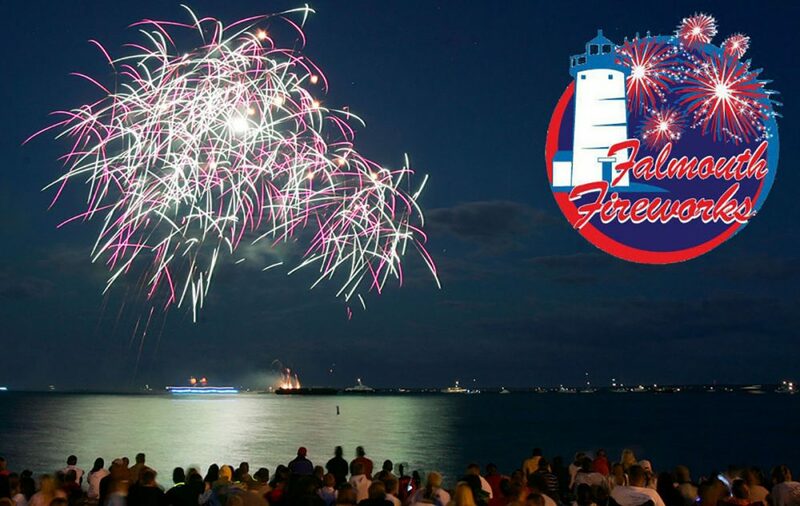 Falmouth Fireworks Needs Your Help To Reach Our 2019 Fundraising Goal! If you would like to honor a loved one in next year's fireworks display please e-mail falmouthmafireworks@gmail.com for more information.